Rationing was a fixed allowance for provisions or food during a shortage. Rationing was especially necessary during World War II because the military needed to have enough fresh food and other goods to feed the growing military. Individuals and families were issued rationing stamps and tokens that represented certain goods. Blue tokens were for canned goods and red tokens were for things like meat, fish, butter, fat, and dairy goods. The OPA, the Office of Price Administration, was in charge of rationing, and it issued tips for rationing. These tips included sharing food with the soldiers, shopping earlier in the day and week, making lists and adding up points before going to the store, planning means, doing all the home canning possible, and how not to blame your grocer for any inconveniences. Careful meal planning was necessary so that everyone could get the nutrition they needed while rationing. Prices for food ranged from one ration point to twenty two points - everything was rationed, even gas. However, the amount of gas per week a family got depended on how important the vehicle was. People were encouraged to ride together in cars. Although everything was rationed, there were still shortages; many items that would normally be thrown away were saved and there were many advertisements used to get people to save and ration. 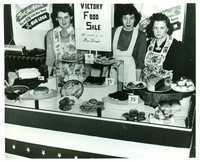 Citizens selling baked goods to benefit the war effort. Many Americans tended victory gardens to grow their own fruits and vegetables; in fact, most people became gardeners. Although vegetables cost less than things like meat because it was more plentiful, families wanted to do as much as they could to save ration tokens. Everyone was encouraged to save one and two point stamps and use five and eight ones instead because grocers couldn't give change in the stores. Students at Fifth Street School were collecting fat for the war effort. Another thing everyone was inspired to do was save all cooking fats and grease. When they had saved at least a pound, they would take it to the grocer, who might pay you two red ration points. Fat made glycerine, and glycerine made explosives; it was said that a pound of fat could make two AA shells. Sugar was also important to making war weapons. The Ladies' Home Journal stated in one issue, "Sugar cane is needed to make molasses. Molasses is used to make industrial alcohol which is needed to make explosives. Explosives are needed to sink the Axis!" After the bombing of Pearl Harbor, Block Wardens were assigned to help carry out the tasks related to protecting communities. They were easily identified by the white helmets and armbands they wore. One of their duties was to monitor the darkening of houses and buildings so that the community could not be seen by bombers flying overhead. During the war, even the lights on the Thomas Hill Standpipe, which supplied the water for the city of Bangor, were extinguished, and the tower itself was camouflaged with drab olive paint. The Flying Torah at D.A.F.B.